Stopping a Dog from Jumping the Fence. I am surrounded by yellow Labradors. First we have my precious Windy who I adopted over 4-1/2 years ago. Than I have two boot campers. 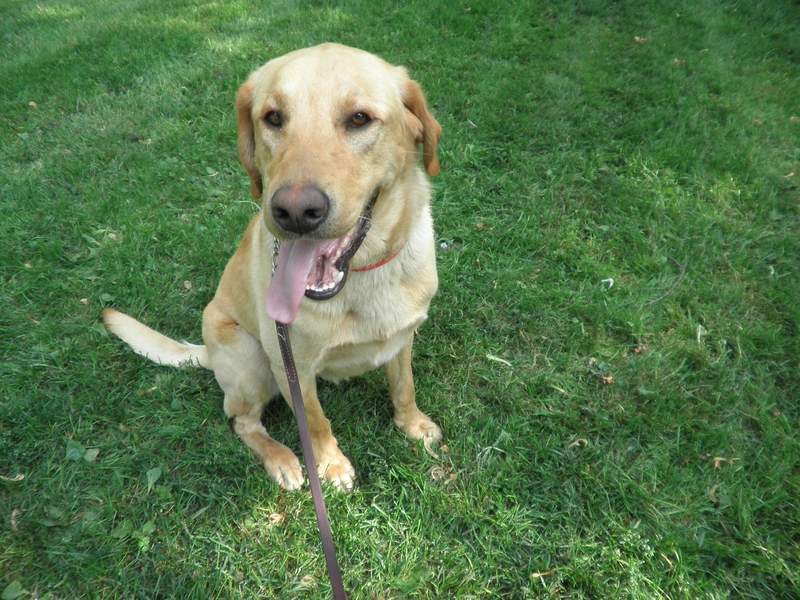 The first one is Isaac an absolutely wonderful sweat laid back and stubborn 2 year old Lab. This was a reflector collar so when I jumped, People could see me when I jumped the fence and ran away. Who will counter surf if given the chance and get into the garbage. 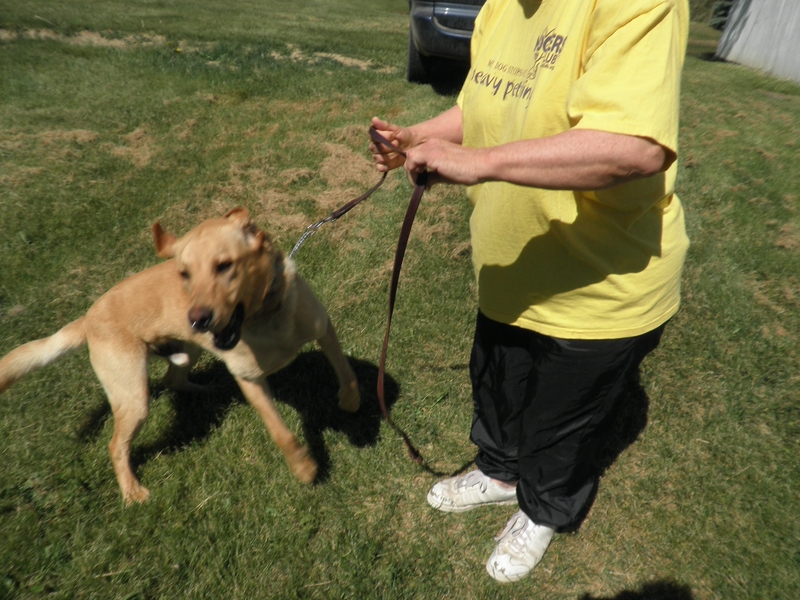 The biggest reason that his owner drove in all the way from Indiana is that Isaac is a fence jumper. Of course he doesn’t walk well on a leash and come isn’t part of his vocabulary. The second boot camper is Duke. He is a neutered male who was given up by his original owner to the rescue group Sanilac Scoopers. He is 2 years old and is absolutely wild. Because of his behavior, he spent most of his life chained up. Bong! How High Can a Labrador Jump? He can spring in the air and reach heights of 5 feet (horizontally) without any effort and of course jumps on people just as high if not higher knocking them over. He is completely out of control. When you put him on a leash he either drags you or knocks you over by jumping on you. He does have a great temperament and is good with kids, just no manners. Look how good I can walk. 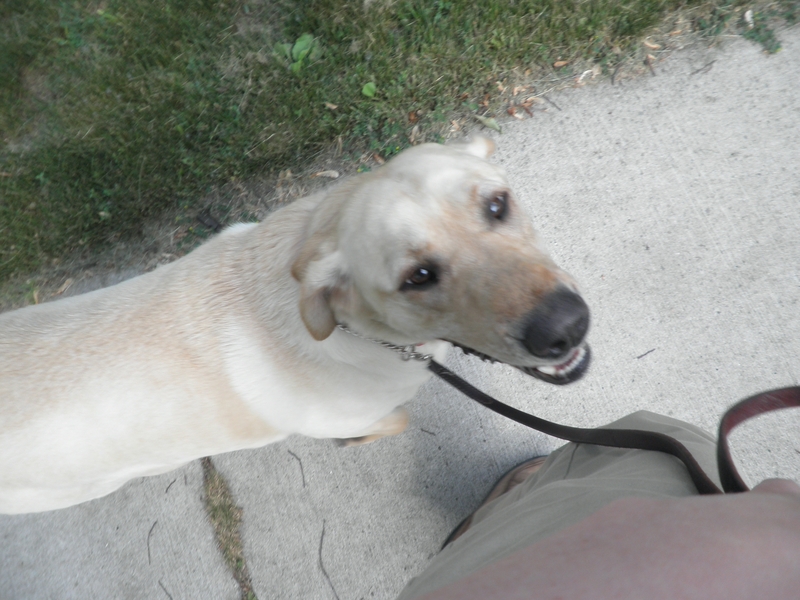 He now walks very well on a leash and today we were working on Sit & Sit-Stay. You can really see his stubbornness when you try to get him to sit. When you say sit he calmly stands there as if to say, “You can’t possibly talking to me.” Even when you show him a cookie his whole demeanor is one of, I don’t have to. Once you get him to sit he has an eternal clock that told him that after 30 seconds he could and should get up. By the time we were done with the morning session he would hold the sit-stay for 3 minutes and I went 10 feet away from him. As I stated in our first conversation the trick is correcting him for fence jumping, because we are doing the training at my house. So far he has not tried to jump my fence. He got real interested one time when a squirrel was just on the other side of the fence. He ran up to the fence and put his front paws on the fence. Of course he was corrected. Now I did forget to ask you how he jumps the fence? Does he clear the whole fence, put his front paws on the fence and push off with his back paws or does he climb the fence? Right now I am continuing to work on walking, sit & sit stay so that they all become more habitual and that he will do them even with distractions. Tomorrow we will also work on down. I’ll let you know how it goes. Duke’s update: I must admit Duke is wild, he has no self control, no manners and is very busy. He is the AD/HD kid of the dog world. You put him on a leash and he goes into instant pull mode. If I didn’t know any better I would say he is part Husky & kangaroo. I want to go East, West, North, South, Up, Down etc. If he isn’t pulling he is trying to jump all over you. Some of his jumping is just from his exuberance and love of people. The other reason is that it is a way to control people. He thinks, “I keep jumping on you, putting my paw around the leash, mouthing you and than you can’t make me listen.” Of course the first thing that I did was to teach him to walk on a loose leash. To be honest when I first started working with him it was amazing. I never knew a dog could go 10 different directions, right, left, behind, in front, up, down and sideways all at once. I have never tamed horses, but it was almost as if I had a bucking bronco at the end of a leash. After about 15 minutes he figured it out and was actually walking by my side. We have had several lessons to work on his jumping. Actually every time he gets out of the crate we have a session or two on jumping, because it is so natural to him to exhibit this behavior. The important part is to remember that even though he is corrected for jumping, when he is calm and not jumping (even if it is for 2 seconds) that he gets a good boy. Often times people only give their dog attention when the dog act up and never give them attention when the dog is calm. Remember negative attention is still attention. By praising when he is calm will teach him what we expect from him. Duke is an affection starved dog who didn’t know why his owner tied him up outside and from there he went to a kennel to await being adopted. I have only had him for a day and a half and already he is jumping less. He is walking almost perfectly on a leash and will sit. Wow! Duke Can SIT STILL. 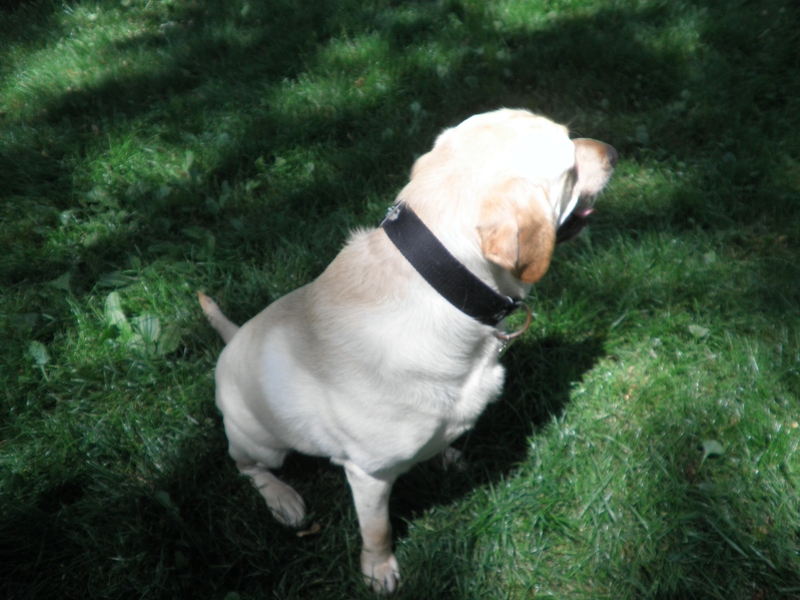 Duke is a field Labrador Retriever. He was bred to run in a field all day long and is always looking for something to do. He needs a job and if he isn’t given a job. He will become bored, destructive and very nervous and hyper. We have had 2 little training sessions and I already notice a calmness about him. He is actually very intelligent and will learn quickly if given the right guidance. I was told that he didn’t even know his name and to be honest, since he was never made to respond to his name when called. He learned that his name didn’t mean anything. If you say his name he hesitates for a second and than is off doing something else. 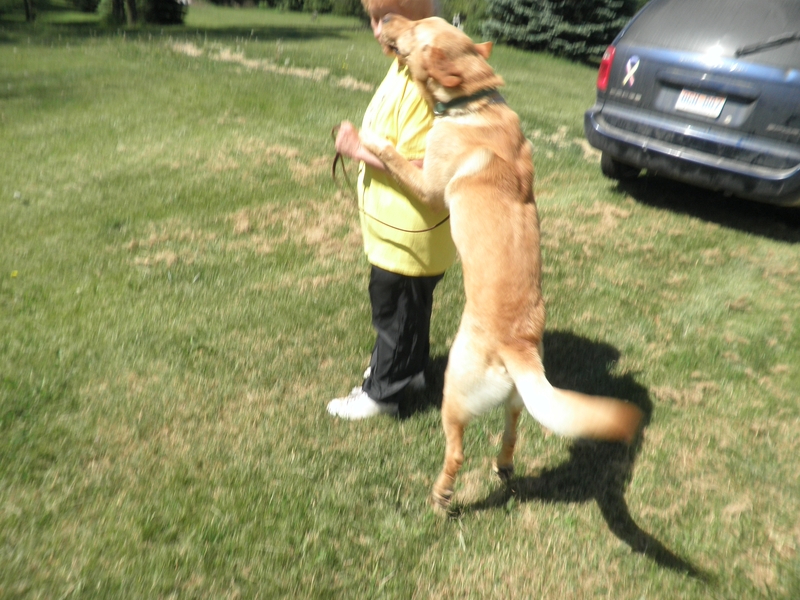 I will have a lot of fun training Duke as under all that craziness he is a great dog. Entry filed under: Dog Training, Fence Jumping, Jumping, running away, Stealing, Uncategorized. Tags: Fence Jumping, Jumping.